I found the following “device” in my mail box today- Google Apps Saving Calculator.The Out-Of-The-Box functionality is damn simple. You select number of people in the organization on the top and see how much $$$ you are going to save when you move to Google Apps. There is also Google Enterprise Apps website. You can call it completely marketing or crazy. Nevertheless, it made me think again about simplicity and PLM. Current PLM systems and environment are very dependable on many pre-requisites, characteristics, options, etc. At the same time, PLM became mature in many organizations. Don’t you think it is a right time to come with some Bayesian prediction about what PLM can save? Time to think… what is your opinion? 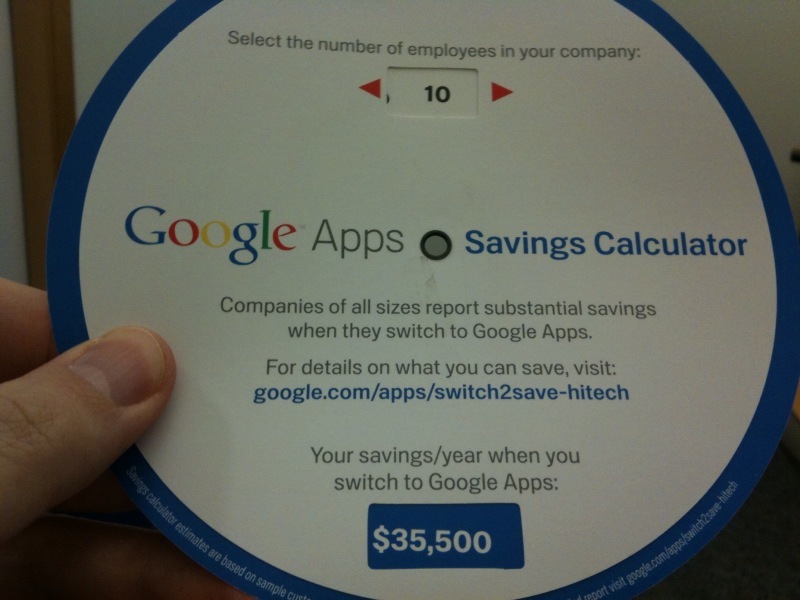 Not that creazy, but I wonder if you can really save 3550$ per employee just moving to Google apps. are there some other parameters on tat disk? Can you post more pictures of that gadget? I will put atleaset $3000 per employee 🙂 and oleg if the software is fOSS you will be saving much more than that coz you will be paying only for the google usage. :-). Brilliant. It’s a good strategy. Once you open yourself up to the ROI discussion, you have a couple of places to go. Either you agree with the numbers and want to know more or you disagree with the numbers and get into a conversation about the true value for a customer. Either way, you’ve moved from glossy collateral to a “roll up the sleeves” working session. I’m working on a home project. The vendor that got my immediate attention is the one that had an ROI spreadsheet. He got me asking a lot more questions and questioning his numbers. Although all of the questions I ask may be more than he bargained for, he took the lead position among the various vendors. If we only had a tool, or possibly a team, that allowed us to help customers assess the business value that PLM would provide them. Sounds like a great idea. It would be a little more complicated than a date wheel, but I bet it would only take 2-3 questions to get a useful discussion started. It is a great idea! I suggest one minor update; add a pull down tab with rows & columns to document the names and salaries of the people you will eliminate as that is the only way to validate the “improvement” with your PLM deployment. Oh well, hold on during the Grand Recession and then move on as soon as you can. The poor bean counters have no experience actually doing product development so you have no option but to translate into the only language they speak = the dollar—which is completely inept at capturing the value. I mean, so what if I move from one iteration of a design on a network drive today to one per hour with PLM and it is available globally? Apparently no value and much higher cost—until you ask to have that CAD file tooled and catch an issue and suddenly…voila you may have done something, maybe not. OK how about a tongue and cheek view? I’ve just spent the last few weeks creating a simple Strategic Financial Model for our Artwork Management Solutions that calculates the RIO on our AMS applications and the results are very compelling. Oleg, I’d love to get your opinion on the calculator I’ve created, how can I share it with you? Yes, absolutely—there are financial implications & value. My post was attempting to illustrate (and poorly I gather) that to derive that value in a compelling and successful (success = approval to spend the millions required to do a PLM effort) way is a very fluid process. In contrast, you and others were saying how cool it was that there was a calculator to show the suggested value for G Apps. Ok, I agree, it is cool but essentially useless. IF and I mean IF you or anyone else in the audience have spent a large portion of your career at fortune 100 companies in hi-tech in IT and worked on exactly what you are discussing you would probably conclude as I have that each and every one of these projects and associated financial efforts is unique and variable beyond “systematizing” with a pre derived calculator. Alas—I wish it was easier & more direct; we could spend much more effort on deploying the tools instead of justifying why we need to do & attempting to show the value it has created.